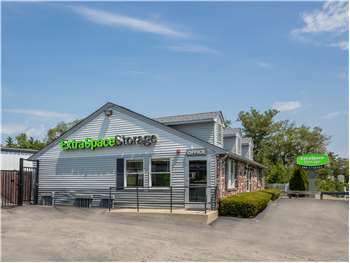 Located on Southbridge Rd just off Leicester St, Extra Space Storage serves residents of North Oxford. Locals will recognize our facility a few minutes southwest of Dunkin' Donuts, Shell, and Cornerstone Bank. I have used storage spaces for many years. At the current time I have one in York, Maine - one in Salem, NH and then your facility. The others are clean, dry and I feel comfortable storing anything in them. However, yours is old, damp and the only thing I feel safe storing in it are yard sale items I will get rid of in the spring. I was also very disappointed when renting the space. There was a sign out front that said "first month free" with a tiny note to see manager for details. I was told this was not for the smaller units. I feel this is false advertising and the sign should have boldly read (for large units only). Drive south on MA-56. Pass I-90 and continue straight. Turn right onto Southbridge Rd. Our facility will be on the right before Pioneer Dr.
Drive northeast on McIntyre Rd. Turn left onto Ennis Rd. Turn left onto MA-56. Turn left onto Southbridge Rd. Our facility will be on the right before Pioneer Dr.
Drive west on US-20/Southbridge Rd. Pass Dunkin’ Donuts and continue straight. Our facility will be on the right before Pioneer Dr.
Drive northeast on US-20/Southbridge Rd. Pass Hammond Hill Rd and continue straight. Our facility will be on the left after Pioneer Dr.